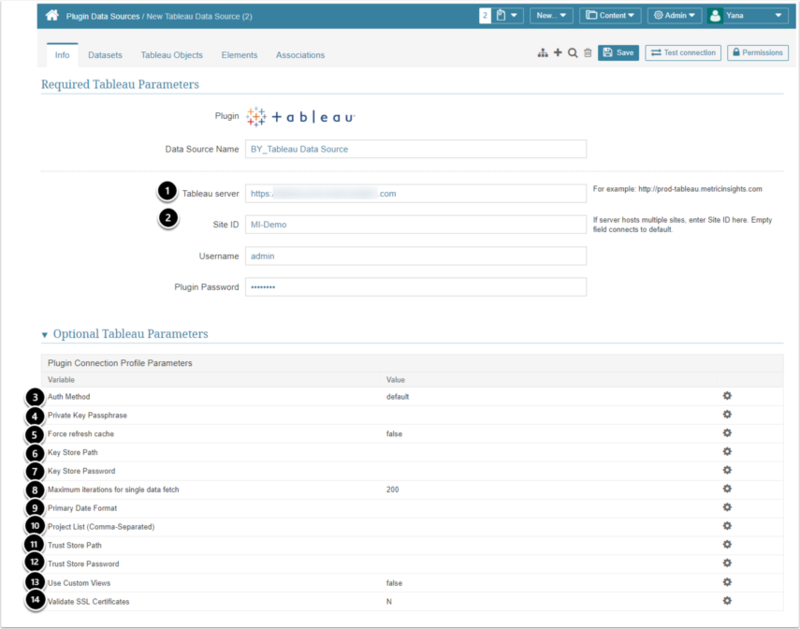 When you create a Tableau Data Source, along with other settings, you need to define mandatory (Server and Site ID) and optional Tableau parameters. This is a server address variable. If the Remote Data Collector (RDC) runs on the Tableau server, enter "localhost". If RDC runs on a different machine, enter the Tableau server name. This is a site name variable. Input Site ID if you need the Tableau plugin to connect to a specific site. Otherwise, if Site ID (name) is not provided, it will connect to default. NOTE: If you are using Tableau Online, this parameter is required. :authMethod=trusted - authentication method via trusted IP (without encryption key). Define the passphrase for the keyStore password in this variable. In order to use the key for public-key encryption, the file is decrypted with the decryption key. SSH does this automatically by asking you for the passphrase. This is a Boolean variable (true / false). Here you can set the possibility to update elements on Tableau server before loading. Enter a path to keyStore on your virtual machine. Here you can specify password to keyStore. Configuring this variable will help prevent Tableau server overload. Before fetching data, the number of required iterations (fetches) is counted by the plugin. Should it exceed the specified number, the plugin will not send the request (to avoid server overload). Enter date format if you want to teach plugin how to handle it (e.g. primary_date_format=MMM YY). Enter the site name if you want to specify it (e.g. site=Sales). By default site=Default. If you use Tableau Online, then it must be specified. Here you can specify the path to store with trusted SSL certificates. Here you can specify the password from store with trusted SSL certificates. Here you can define whether to check for a SSL certificate. Plugin will ignore if it is a self-signed certificate.